In this video: What Does the Bible Say About Humility? 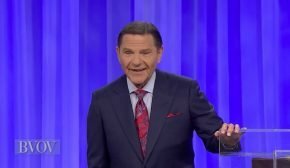 In this episode of Believer’s Voice of Victory, Kenneth Copeland leads us in a study of 1 Peter 5 and shows us what the Bible says about approaching God with humility. Humbling ourselves before God is the casting of all our cares, worries, concerns and anxieties onto Him. He is willing and able to take it all! Catch up with the previous week in this series, The Call of Faith. Watch the next week in this teaching series, The Will of God to Heal.